Our emotions can feel so big sometimes; so big that they can feel overwhelming and out of our control. When your emotions feel overbearing, how do you comfort yourself? Some people may be able to list out things that soothe them, but others may struggle to think of an adequate answer that question. 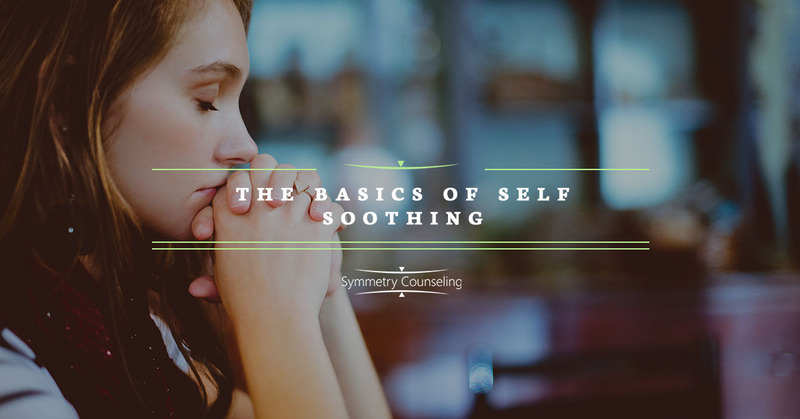 Self-soothing, or grounding techniques, are used when we feel distressed, triggered, or overwhelmed by emotion and are essential to a healthy life. One of the skills every child is supposed to learn is how to soothe themselves when they are upset. Parents typically teach this through physical touch, validation, and reassurance as the child matures; however, others may never learn properly. If you never learned healthy ways to self-soothe, it may be difficult to deal with common life stressors and anxiety. When this happens, it can be easy to turn to unhealthy coping strategies such as alcohol, food, or self-harm. Below are a three basic self-soothing strategies anyone can use to help stay calm and grounded rather than feel helpless. When we go through distress emotionally, sometimes we need someone to comfort us as tell us that it will be okay. The truth is, sometimes we don’t always have someone there to do that for us. While this may take some practice, try changing your self-talk to something more positive. Rather than thinking, “I don’t know what to do” or “I can’t get through this alone”, try telling yourself, “I will get through this” or “This feeling will pass”. Believing in yourself and rationalizing the situation are great techniques that will help you calm yourself in the moment. Your breath is one of the first things that can feel out of control, but is also one of the first things you can control. A breathing exercise I recommend is the 4-7-8 breathing technique. Close your eyes and breath in your nose for four seconds, hold your breath for seven seconds, and exhale out your mouth through pursed lips for eight seconds. This technique should help reduce your heart rate and regulate your breathing relatively quickly. Continue the exercise until you feel relief. Using your senses can instantly create comfort and relaxation. Sensory activities are different for everyone and can change depending on the situation. For example, if you are feeling intense anxiety it may be helpful to go for a walk, listen to music, or clean. If you are feeling sad\ you may feel comfort in the smell of a candle, the softness of petting your dog, the taste of warm tea, or the sensation of rocking back and forth. Find what works best for you and stick to it. At the end of the day whatever you choose should make you feel calm, comforted, and soothed. If you are finding it difficult to self-soothe and would like some support, it may be useful to connect with a therapist. Contact Symmetry Counseling at 312-578-9990 to set up an appointment with one of our very skilled therapists today!